Attain a fulfilling personal life and high career goals! This law says, "There is never enough time to do everything, but there is always enough time to do the most important thing." When you run out of time and the consequences for non-completion of a key task or project can be really serious, you always seem to find the time to get it done, often at the very last minute. When you have no choice, when the consequences for non-completion are serious enough, you start early, you stay focused, and you drive yourself to complete the job rather than to face the unpleasantness that would follow if you didn't get it completed within the time limit. 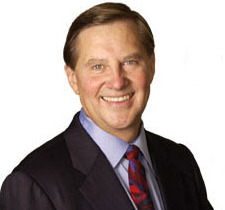 Maximize your time, performance, and wealth in 2016. 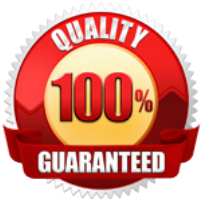 Click here to learn the only reliable and secure investment in today's world! It is much better to better your planning skills, and then build in a sizable buffer to compensate for unexpected delays and diversions. However much time you think a task will take, add on another 20% or more, or make a game of getting it done well in advance of the deadline. You will be amazed at how much more relaxed you are, and how much better a job you do when you stop procrastinating. There are three questions that you can use on a regular basis to help you stay focused on getting your most important tasks completed on schedule. The first question is "What are my highest-value activities?" The second question you can ask continually is "What can I, and only I, do, that, if done well, will make a real difference?" Take inspired ACTION in 2016 — the difference is extraordinary!? 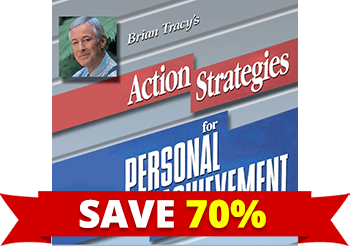 ORDER Brian Tracy's Action Strategies for Personal Achievement and receive an INSTANT SAVINGS of 70% OFF the regular program price! The third question you can ask is "What is the most valuable use of my time, right now?" Do first things first and second things not at all. As Johann Wolfgang von Goethe said, "The things that matter most must never be at the mercy of the things that matter least." 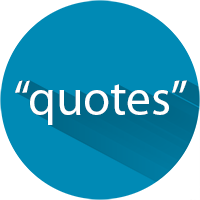 Johann Wolfgang von Goethe said, ''The things that matter most must never be at the mercy of the things that matter least.'' Stephen Covey said, ''The main thing is to make the main thing the main thing.'' There is a rule that says that every minute spent in planning saves 10 minutes in execution. Make a list before you start, to ensure that when you do begin work, you will stay focused on that activity that can have the greatest possible consequences for yourself and your business. Refuse to ''major in minors.'' Keep asking yourself, ''What's really important here?'' Your ability to ask and answer this question will keep you on track and staying focused throughout the day. In A.D. 1342, the philosopher William of Occam developed a concept that has come to be known as Occam's razor. This principle says that, in dealing with any problem or complex issue, the simplest and most direct explanation or solution is usually the correct one. What this means is that you should refuse to allow yourself to become overwhelmed with trivia and detail. Stay focused, and start off by trying the simplest possible solution. At the beginning of your day, make a list of everything that you have to do during that day. Go over the list and number the top seven items. Ask yourself, ''If I could do only one thing on this list today, which one task would it be?'' Put a ''1'' next to that task or activity. Repeat this exercise until you have your major tasks organized from one to seven to help you stay focused throughout your day. In your business you should apply triage as well. Stay focused on the problems that can be solved if you act immediately. Refuse to worry about situations that cannot be resolved. Let them go. And don't waste time on situations that will take care of themselves whether you do anything or not. Stay focused on the problems, decisions, and activities where immediate action is essential to saving the situation. YES, I am ready to learn how to achieve the success I have always dreamed of! 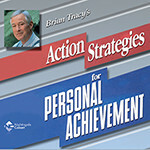 Please send me Brian Tracy's audio program Action Strategies for Personal Achievement — including 24 AUDIO CDs and a PDF WORKBOOK for just $149.95, which is 70% OFF the regular program price.